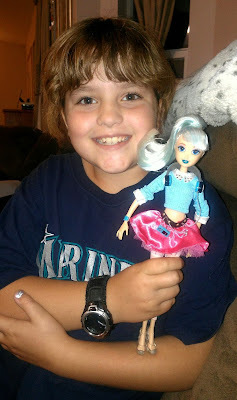 My daughter is 9 1/2 years old, and although she still enjoys playing with dolls, she's getting older and her preferences have changed! She's at that in-between stage when girls are outgrowing traditional princess play but easily relate to the tween versions of princess and fairy tale characters! Facing the fact that my baby is growing up is proving to be difficult, instead of wanting to play with baby dolls... now she is loving her Fairy Tale High teen dolls. I will admit that there are certain dolls for girls that I refuse to let my daughter play with or have. 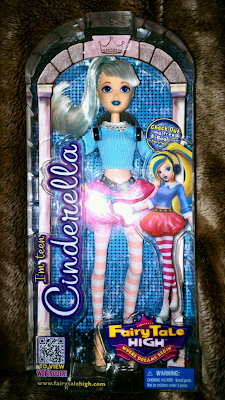 I love the fact that Fairy Tale High Dolls are age appropriate; from head to toe, clothing included! Fairy Tale High fashion dolls are pretty and their clothes are bright, fun and colorful! They are your daughter's favorite princesses, just grown up like they are! They also come with fun accessories like headphones and cell phones! Enter the magical world of Fairy Tale High®, a place where magic happens and beloved fairy tale characters come together for the first time ever in a modern-day high school setting. Toting the latest accessories and sporting designer fashions and hip hairstyles, teenage Snow White, Rapunzel, Belle, Sleeping Beauty, Little Mermaid, Alice in Wonderland, Tinker Bell and Cinderella are brought to life as they might have been before they became fairy tale princesses. Fairy Tale High features a collection of beautifully designed fashion dolls, along with a series of webisodes and eBooks found for free at www.fairytalehigh.com, that showcase each character’s teenage story, revealing the qualities that will eventually make them princesses and the not-so-perfect flaws that trip them up along the way. As students in a performing arts high school, these hip and trendy teenage characters develop their talents and learn new ones as they study music, dance, art, and acting while dealing with romances, jealousies and personal challenges along the way. With guest appearances by classic heroines and villains like Victoria, the Wicked Witch of the West; Pinocchio, who cannot tell a truth; and many others, Fairy Tale High is for the princess-loving girl who is looking for one she can relate to. Hi, my name is Teen Alice in Wonderland. My friends call me Ali. I go to Fairy Tale High with my BFFs, Belle, Little Mermaid and Tink. I love painting and exploring new places. I have the cutest striped kitty cat named Chessie that I adore. Sometimes he sneaks into my backpack and comes to school with me. I hope he doesn’t make anyone sneeze! Hi, my name is Teen Belle. My friends call me B. I attend Fairy Tale High with my best friends Alice, Little Mermaid and Tinker Bell. My favorite class is cello. I have been playing the cello since I was seven years old. After many years of practice, I'm actually pretty good. I also love, love, love shopping for new clothes and hanging out with my friends. I'll see you again soon. It's time for cello practice. 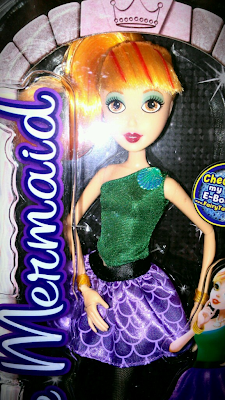 Hi, my name is Teen Little Mermaid. My friends call me M. I'm so excited to be going to Fairy Tale High with my BFFs Tinker Belle, Alice and Belle. I am so in love with the beach and swimming! I live in a palace under the sea with my family and swim many miles every morning to get to school. I am also captain of the swim team! You can also find me singing my heart out before school, after school, even during school! Singing is one of my favorite things to do in the whole wide world. I know my voice classes at Fairy Tale High will help my singing be even better. Hi, my name is Teen Tinker Bell. My friends call me Tink. Fairy Tale High is the best school ever. I love hanging out with my friends Alice, Little Mermaid and Belle. I also love creating cool gadgets out of my friends’ stuff and fixing computers. I sing in a rock band called The Pixie Chicks. You should definitely check us out. Well, it's almost time for class. Having wings makes it a breeze to get to school. I can just fly there!!! Hi, my name is Teen Beauty, but my BFFs call me Sleeping Beauty, because I need a ton of beauty rest! I take naps whenever and wherever I can. I attend Fairy Tale High with Cinderella, Snow White and Rapunzel—my three fav friends! I am really into making clothes and my favorite class at Fairy Tale High is Fashion Design. I love creating fabulous outfits for my friends when I am not busy trying to stay awake during math class. Boy, I sure hope Rapunzel will share her notes. Hi, my name is Teen Cinderella. My friends call me Cindy. I go to school at Fairy Tale High with three of the coolest kids in the kingdom—Rapunzel, Snow White and Sleeping Beauty. I have the best shoe collection... although I always seem to be missing one! I could dance all night, but I never stay out past midnight. I can’t wait to have a ball with my prince charming at the school prom! Hi, my name is Teen Snow White. My friends call me Snow. I just love going to Fairy Tale High with my best friends in the land Sleeping Beauty, Cinderella and Rapunzel. I am crazy about music and love writing songs! In my free time, I play the piano. But who has the time? It seems like I am constantly taking care of my seven little brothers! That's okay though because family comes first. Hi, my name is Teen Rapunzel. My friends call me Gigi (that stands for Golden Girl, because my hair is so, well, gold)! I attend Fairy Tale High with my besties, Cindy, Snow White and Sleeping Beauty. Hair is my life! I style it and work it every day and night. You’ll never spot me with a bad hair day, and thanks to my style abilities, none of my friends have to worry about that either! When I’m not fussing over my hair or someone else’s, I’m singing. Even though I am only in high school, I am already a professional singer and perform shows all over town. Come see me at my next gig! I always get back stage passes for my friends. Fairy Tale High Dolls are available nationwide at Toys R Us stores, select Wal-Mart stores and online retailers. Who is your daughter's favorite princess? What a fun twist on plain dolls! My niece really likes Cinderella. My granddaughter loves Cinderella -- she really loves them all!